It was raining when we awoke but had eased off by the time we set out to visit the market and purchase more supplies. The port was quiet but nearer to the piers, the police were out checking that no-one had been sleeping on the beach. A brave couple who perhaps had not seen the weather forecast were setting up their chairs down on the beach. Provisions purchased we wandered back through the shops as we have some presents to purchase for birthdays. The rain returned with a vengeance and the cloud was descending over the sea as we headed back to the apartment. The couple seen earlier were rushing back to the shore. 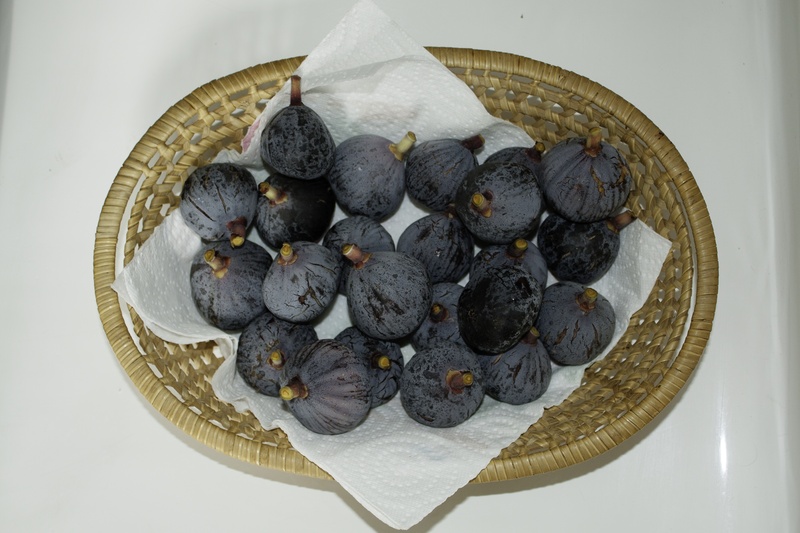 As we dried off and had coffee, our landlady appeared with a basket of figs for us from the tree I had admired the other day. An ideal partner for my goat’s cheese lunch and they have solved the need to look for desert for the rest of the week. My much smaller tree back home has so far, produced three figs to eat this summer. The rest of the day was spent decluttering my computer of old files and numerous copies of photographs, a task that has been long overdue. Tomorrow’s weather forecast is much better.